Singleton first came to the attention of scouts and college recruiters in the summer of 2007, when he was 15 and with a wood bat, he blasted a 400-foot home run out of Inland Empire’s ballpark. His frame and natural hitting ability have impressed scouts, though his results have lagged behind. At 6-foot-3 and 200 pounds, Singleton has an impressive build, and his large, strong hands indicate natural power potential. He has a sweet, fluid swing, and his bat speed produces an audible “whoosh” as he swings at a pitch. He has struggled to connect with quality pitching at showcase events, and an early-season slump this spring drove down his stock. His backswing can get wrapped and unnecessarily long, leading to problems making solid contact. As the season has progressed, though, Singleton has warmed up. He impressed a group of 30 scouts in an Easter tournament game by ripping several base hits. He has excellent defensive skills, and should be an above-average defender at first base. Singleton is just 17, so a club that thinks it can draw out his terrific natural hitting ability can be patient in developing him. He could also shoot up draft boards in three years if he opts for Long Beach State instead of pro ball. Jonathan Singleton is a 2009 1B/OF with a 6’2”, 218 lb. frame from Lakewood, CA who attends Millikan HS. Jonathan is a very strong well built left handed hitter with big time power. He has lift in his swing and the ball flies off his bat like a rocket. He has easy power now, but he is also a very good all around hitter with a good approach at the plate. He put on a show in the inaugural Rawlings homerun challenge putting balls in the upper deck of the Metrodome, measured at well over 460 feet. He is an athletic player and light on his feet for a man his size and also has good arm strength at 1B. His power bat from the leftside will definitely bring out a lot of people to watch him. A top 2009 bat for next years draft. Aflac All American. Singleton showed loads of potential in high school and would have gone higher if he did not have a disappointing senior season. After May, Singleton’s pace did slow down. He still showed impressive power and hitting ability. He finished with a .290 average, while hitting 14 home runs. Baseball America ranked him the number 1 prospect in the South Atlantic League, ahead of high around picks such as Tyler Matzek and Nolan Arenado. In December they ranked him the second best prospect in the Phillies system behind only Domonic Brown. Following all the success this season, Jonathan has sky rocketed up top prospect lists. He is now viewed as one of the top first baseman in all of the minor leagues. Because the Phillies have Ryan Howard signed through 2016, they are making an effort to move him to a corner outfield position. The early reports are encouraging that he will be able to handle the transition. Jonathan is not expected to make the majors for at least several more years, but with comparisons to Ryan Howard and Frank Thomas, there is plenty of reason to keep a close eye on his development. Scouting Report: Below is an assessment of Singleton’s raw tools, rated on the traditional 20-80 scouting scale. The grades are my estimation based on what I’ve read and those I’ve talked to. The second number is a future projection, the first number is the current assessment. Summary: Singleton’s calling card will be his bat, and he’s shown the ability to make at least average contact for a power hitter, with the chance for more as he gains experience and improves against offspeed pitching. He’s only started to tap into his raw power, and as he matures physically and learns which pitches to pull, he should develop plus power. His athleticism should allow him to be either an average or a tick below LF or a slightly above average 1B. He won’t be a base stealing threat, but he shouldn’t be a base clogger through his peak. Upside: Singleton shows all the tools to be a well above average major league player. He has plus bat speed and a quiet swing that produces easy power. Singleton has shown the ability to hit the ball the other way, which is rare for such a young player. Another rare talent that Singleton displays is his batting eye. 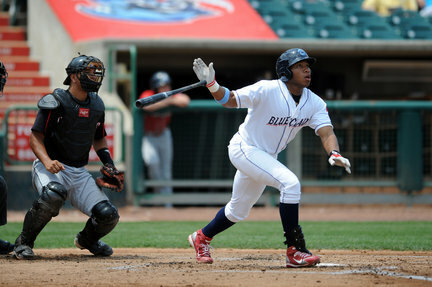 It’s easy to see Singleton hit .290 with 35-40 home runs and a OBP close to .400. Singleton plays a very solid first base and would be above average at the major league level. With Ryan Howard anchored at first through 2016, the question arises, where does he play? The Phillies plan to play Singleton in the outfield this year and the early reports are that he can handle the position just fine. Notice how quiet his setup is. He has a quick trigger and his bat stays on a nice plain. Another thing to take not of his how hard he hits the ball. Everything comes off his bat much faster then the average prospect. When a player shows you such quick hands and everything else you can want in a prospect, there is reason to be excited. If Jonathan Singleton is going to play in Philadelphia, he can’t be a full-time first baseman. Ryan Howard is locked up as Phillies first baseman through 2017. So the experiment to see if Singleton can handle a move to left field with high Class A Clearwater is underway. The early returns are pretty much what you would expect, according to a scout who has seen him this year. As the scout explained, he wasn’t going to ever say a 19-year-old couldn’t learn how to play the outfield. It’s just fair to expect rocky patches along the way. Singleton’s followup to last year’s excellent .290/.393/.479 season hasn’t gone as well at the plate. He’s batting .267/.372/.336 and hasn’t collected an extra-base hit in nearly a month. But it hasn’t seemed to affect his confidence at the plate. The scout meant that as a compliment. He believes Singleton’s confidence and his simple swing will allow him to turn things around. On the mound, Singleton’s teammate Jarred Cosart has put up solid numbers as he’s mixed excellent starts with erratic ones. In other words, he’s your typical strong-armed 19-year-old righthander. Cosart’s stuff looks much like it did last year: 94-97 mph fastball with solid life, a good curveball and an improving changeup.